Salted and smoked meat from the back and sides of a pig. American bacon (or "streaky bacon" as it's known in Britian) is a very fatty slab taken from the underside of a pig. The sliced bacon found in grocery stores is usually cured and smoked. Bacon can be a good source of protein and iron. It also contains several vitamins and minerals including B12, B2, niacin, Vitamin D, Vitamin A, iron, zinc, selenium and copper. 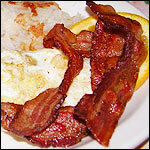 Despite positive changes in feeding and breeding techniques (today's pork products have 31 percent less fat than they did 20 years ago), bacon is still high in saturated fat and should be consumed sparingly. The amount of calories in a stip of bacon is relatively low at about 50 colories. Canadian bacon, taken from the loin or back of the pic, is closer to ham in taste and texture. It is much leaner than American bacon.